Hey ya'll! As promised during last week's kitchen reveal, today I'm finally sharing how I painted the tile countertop that's in part of our little kitchen. And I'm so excited.....this is a project that I've been wanting to do for a really long time! Real talk: I've been karate chopping my tile countertop every time I walk by it for nearly a year. Virginia hate countertop. So, first things first, a little back story. When we first moved into this house, this is what the kitchen looked like. It wasn't perfect, but relative to the other options in our price range, I was pretty excited. 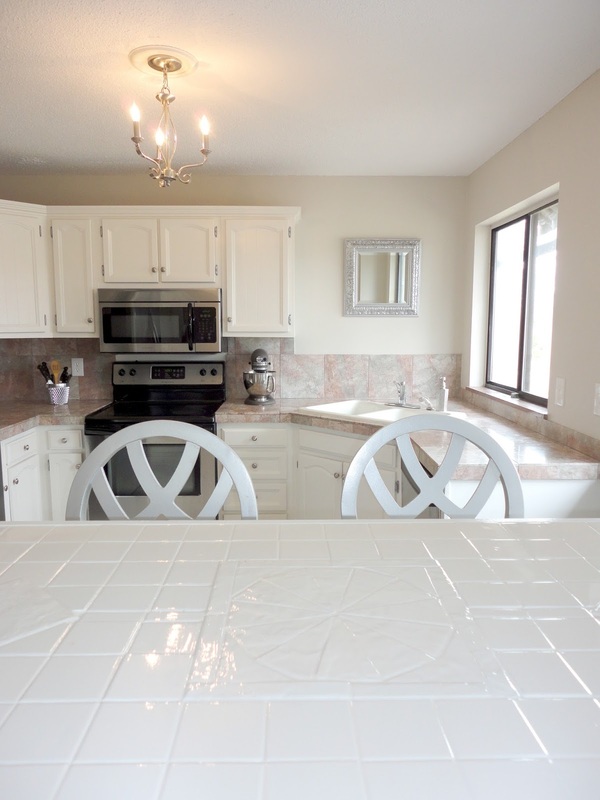 The countertops were granite tile, the cabinets were white, and the floors were a nice gray tile. 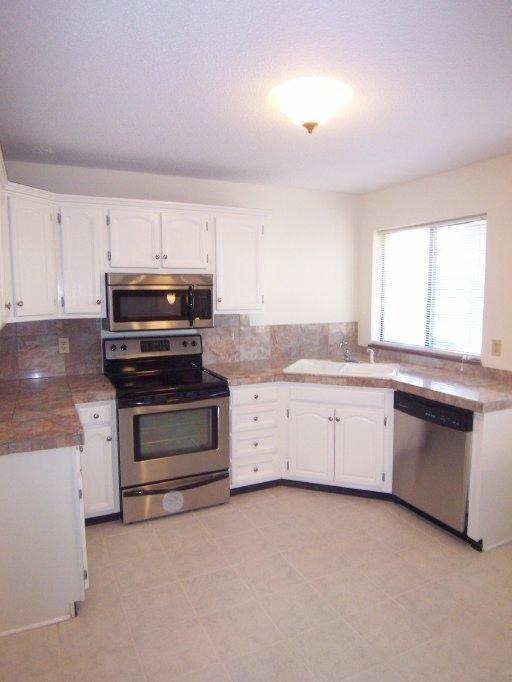 All of the other houses in our price range had formica countertops, linoleum floors, or beige appliances. 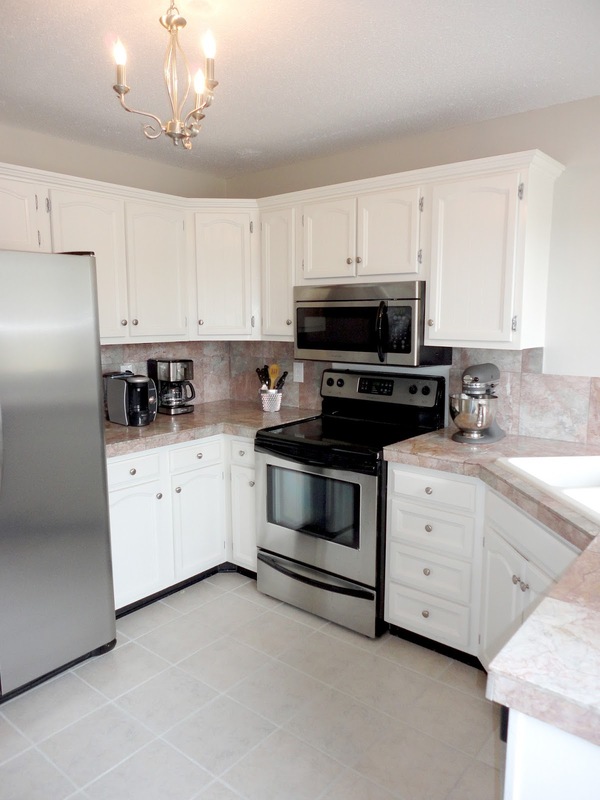 So, although this kitchen was small and still needed some work, I loved it. 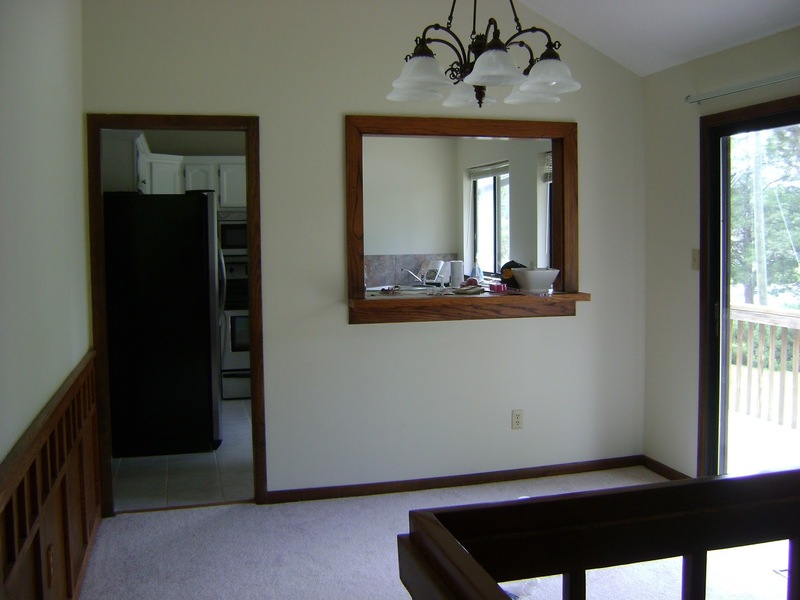 This is actually the picture that was in the real estate listing. The only thing that I really disliked from the start was the mosaic tile countertop that was on our look through bar area on the opposite side of the kitchen. It just felt kinda dated. Here's what it looked like around the time we moved in. And here's what it looked like standing in the dining room and looking into the kitchen. I really want to knock down that wall, but for now, all I can do is work with what's there. One day, little wall. I had been looking all over the place for some sort of way I could update this little area. 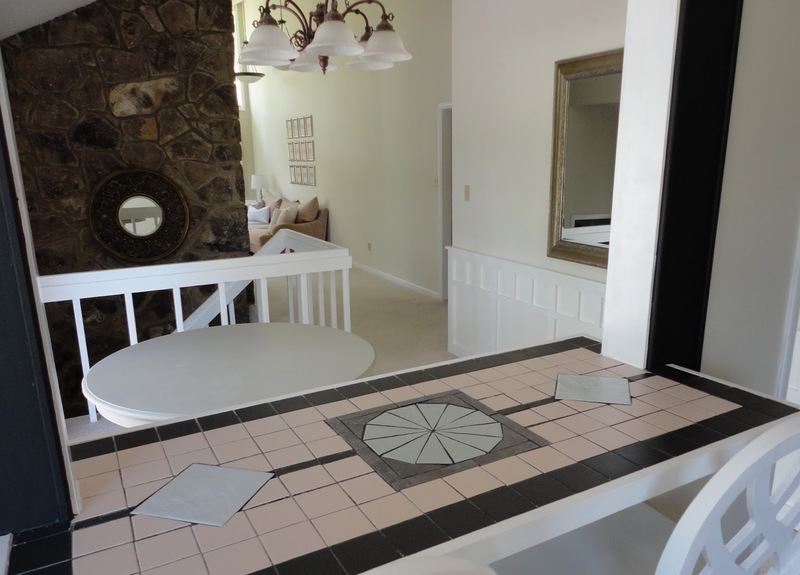 My first attempt was to try to just paint some of the tile with latex paint. I coated it with polycrylic, but it totally didn't last. So, total fail on that idea. You win some, you lose...your mind sometimes. So, I went back to searching for something that would last longer. And that's when I found something awesome. The results were absolutely amazing, and it wasn't very hard to do at all. In fact, it was only two steps. 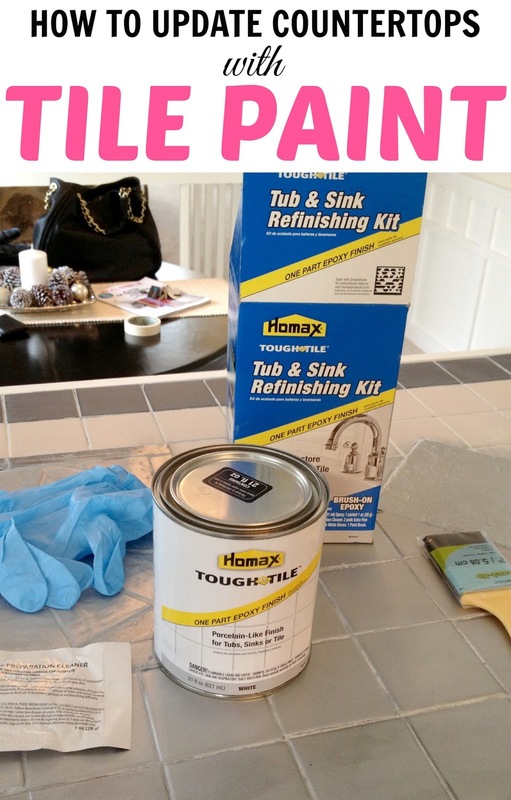 I used a product called Homax Tough Tile Tub & Sink Refinishing Kit (affiliate link). I read the reviews online and people didn't seem to like the results when it was used on tubs, but I decided to try it anyways. And let me tell you, I've now painted a sink, a tile countertop in the kitchen, and a tile countertop in the bathroom. And all three turned out pretty awesome. Obviously, it's not going to be as durable as real tile or a real sink, but for $30, total win in my book. I found my kit at Home Depot for about $35, but the kit is cheaper online. This kit comes with several parts. Please read the instructions very carefully. I also opened all of the windows in the house to allow for adequate ventilation. 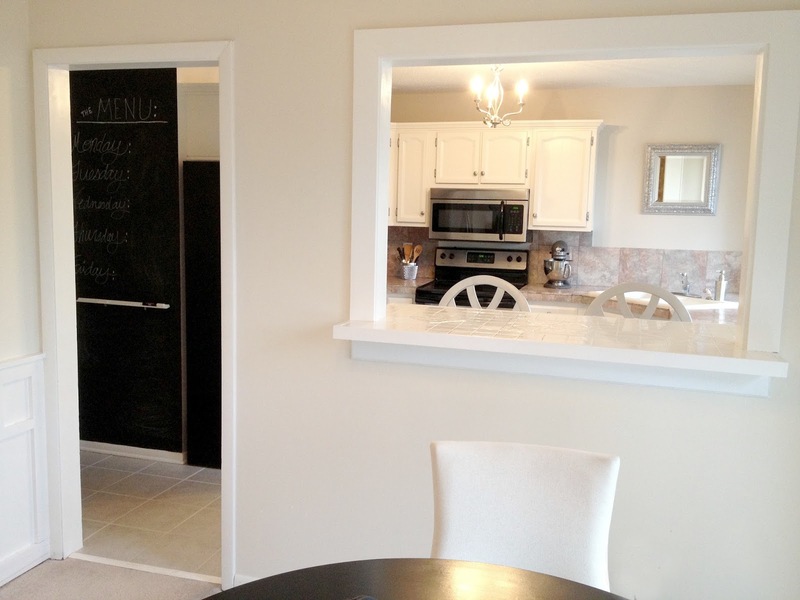 Our tiled countertop is right next to an exterior door and two giant windows. I had them open the entire day. Being able to do so really helped to lessen the intensity of the fumes. DO NOT BREATHE THIS PRODUCT IN. It is crucial that you wear a proper mask. The fumes are so strong and won't dissipate for a good 24 hours. I painted my tile in the morning so that we could leave the house for the rest of the day. The first thing the instructions tell you to do is to clean the tile with the solution provided. It comes with a packet of powder. I used a large bucket to mix the powder with water, and then just washed the countertop with the solution and a small rag. The kit comes with a paintbrush and epoxy paint. I started on one side of the tile and just brushed on the product. You will see brushstrokes at first, but they leveled out on their own very quickly. I worked my way from side to side with the epoxy paint, brushing a light coat of the product over all the tile and grout. Here I am, finishing up the first coat. 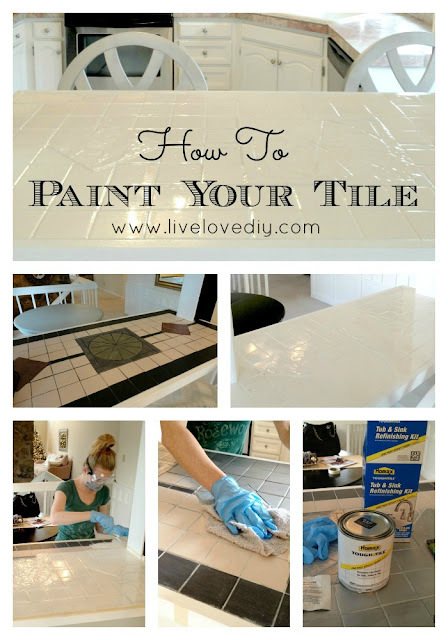 With just one coat, you'll still probably be able to see your tile underneath. Let the first coat dry for a couple hours, and then apply a second coat. Next time Jesse takes me on a date, I'm totally wearing this outfit. After the second coat dried, this is what my countertops looked like. Two coats totally did the trick and was plenty to cover my tile and provide a great looking finish. You may need less or more coats, depending on the surface you paint. The instructions said the epoxy paint would cure in a few days. In my experience, it took a lot longer. It was fully cured after about a week. It was frustrating to have to wait so long, especially when the instructions said it would take a few days, but ultimately I was pleased with the final outcome. In the week it took to dry, my cats managed to dig their claws into it several times, so I'll have to touch it up in a few spots eventually. Tootie and Cheese desperately need kitten mittens. Overall I love the way this turned out, and it totally updated my countertop and made it fit in better with the rest of the kitchen. It's no longer a total eye sore. And I no longer have to karate chop it. Mission accomplished. Thanks so much for stopping by today, ya'll. I'll be back tomorow with all the crazy updates on the master bedroom. P.S. 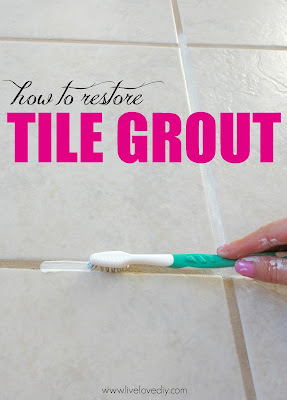 While we're talking paint, if you missed my post on how to restore your dirty tile grout click here. Nice job!!! Too bad it took so long to cure. Cats can be such a pain!!! 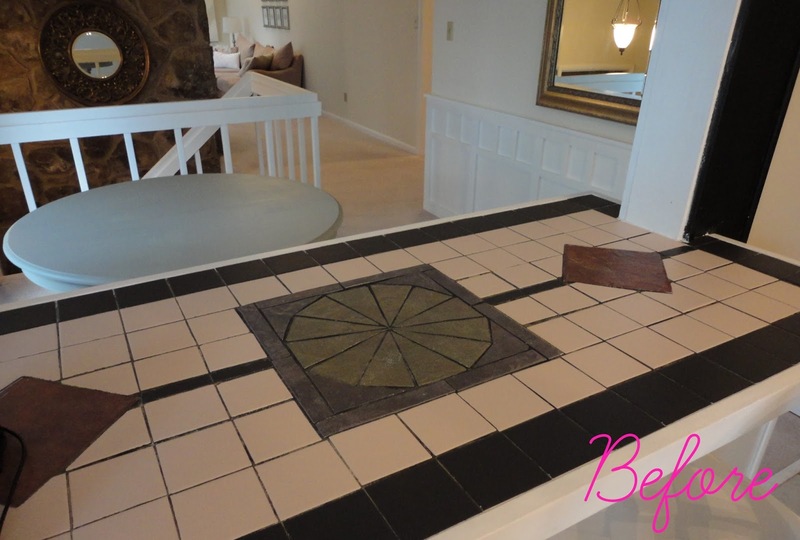 Love that you are not afraid to tackle any project - your tile looks amazing!! Oh this is some kinda amazing, my friend. Magical. PS: you look hawt in that mask. Rock it, sista! That is a huge change. Thank you so much for all info on how you did it, I am thinking about redoing my laundry room sink and it is good to know in advance about the strong fumes. wow! This might be just what I'm looking for. Just moved into a new home that hasnt been lived in for a year or so. The tub and tile are a little dingy. I've used every cleaning chemical and Pinterest formula I can find and probably killed a few to many brain cells in the process. I've decided the tub and tile might not be dirty, just worn. They are white too.Is that whats its for? Can it be used on a tub? I gotta do this! This project turned out so beautifully! I'd love to pin it to The Home Depot Inspiring Tile pinboard if you don't mind! Hi Virginia, I think it looks fantastic & I'm so impressed that you thought of it. What an amazing transformation! This looks fantastic! Now I know what I am going to use to cover the mellow yellow outdated tile in my kids bathroom! Thanks for the tips! PERFECT! this is just what i was looking floor. I will have to try this on my old dated tile too. Thanks for sharring. Great results you got too. What an easy project with dramatic results. And I love those round-back aluminium looking chairs. Where did you get those? I would love to try this, but I worry about the cat factor. I have 4 cats.... you thought 2 were bad? lol Might have to give it a try though. Thanks for the tutorial. This is awesome! Any thoughts on whether you might be able to do this in some color other than white? I'm definitely going to use this in my shower either way! Thanks for the great tutorial! Just what I was looking for... and so are those bar stools! Where did you get them? this post is so detailed. thank you! i feel less hesitant about doing this now. how has it held up over time? We have ugly (I mean REALLY ugly) plum colored tile on our counters & back splash. Some of them even have actual plums painted right on them..did I mention ugly? Hi there! Yes, they have held up really well! I've had to touch up a few spots, but it was really easy to do and only took a minute. I really love the way it turned out and it's been great! I love this! Our 1975 home has a white walled shower with the same olive green floor tile as the bathroom floor!! This would be perfect for that! Thanks for the tutorial! How does it clean? My grout in my shower is pretty rough (maybe not the most professional job) and I'm wondering if it would go over it smoothly and clean well. Thanks! Absolutely LOVE THIS! I have LOTS of tile counters, have loved them since we built, but now it's time for a change. I haven't ever seen the product you used! That is about to change! I am here to learn -- so teach memories PLEASE!!!. Hi Gloria! Thank you! I'm not sure, but I think I remember it coming in several different colors. This is wonderful. I am thinking about doing this for the backsplash in my kitchen. Do you think it will work the same on a vertical surface? Sarah I was wondering the same thing! I've read it works well on vertical tile like in bathrooms so I'm assuming in a kitchen it would be just as fine too! My real question is if it would be possible to paint on the layer inbetween the white paint and the epoxy to get a design in there? Anyone have any advice on that?? Hi ladies! Yes, I think it would work just fine on a vertical surface. I've not tried it myself, but it seems as though it would. Hope that helps! That is an enormous improvement! Might need to try this on the dang hunter green 90s tiles in my bathroom. We have a coffee table that is a natural looking rock and I'd like for it to be more modern looking. This seems like it will work. I'll keep you posted on the results! Thanks for the detailed tutorial. Hi Jenny! Yes, it's held up great! just found you via Pinterest. I'm your newest follower and big fan. this tutorial was great. Thanks so much! So happy to have you as a reader! I just found you on Pinterest too! So glad I did! Do you think this would work in the shower? I need to paint the grout & the tile. Much cheaper than replacing the tile! Hi there! We just bought a home, so I'll be frequenting this blog.. frequently. 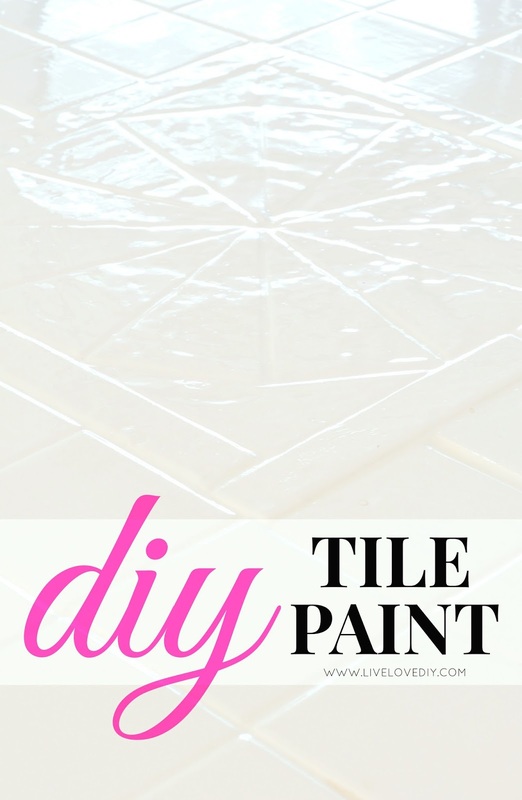 Has anyone tried this on tile floors? It would likely be a stopgap measure for about a year before we fully replaced it. I'm guessing it would work, but would love any thoughts or experience! Do you think this process would work on the old 70s cultured marble counter top? Thanks to your posts, I have summoned the courage to paint a very large dresser. After being told by a "paint" person at a major hardware store, the products you suggested, in her opinion wouldn't work for my project, I told her I had done my research and that I didn't ask for her opinion. I just wanted my primer tinted. She was trying dissuade me from my crafty plans and I was getting really ticked off! 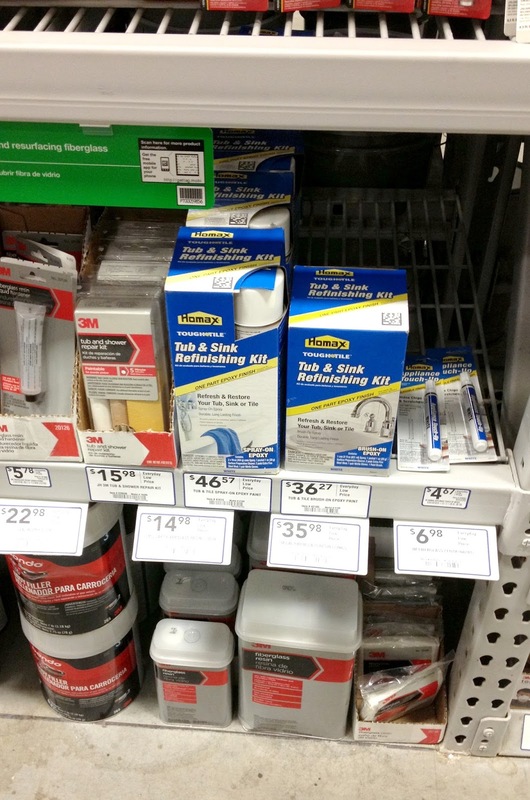 I ended up leaving the cart with all my supplies right there and went across the street to the other "major hardware store" I grabbed the same supplies and for grins, I asked the paint guy there if this would work for what I wanted to do. He was impressed that I knew exactly what to get, and said I wouldn't have any problems! So thanks for listening to my vent... wish me luck! And, thank you for your informative and witty posts! Would this product work on bathroom ceramic sink? Cant take the peach color we r about to move into and it may be my 14 yr old son,s bathroom ! 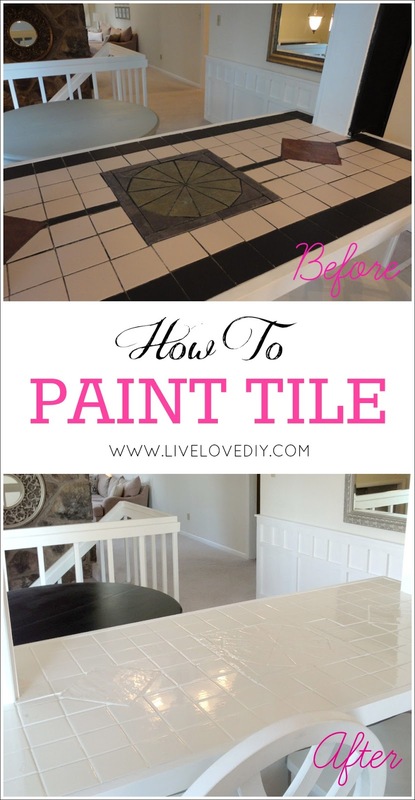 I love your painted tile; it is beautiful! I was wanting to know how it has held up. Have you had any problems with chipping or peeling? Thanks for the information! This is great! We have a vanity bathroom in our home that has red brick colored tile flooring! Its really not great. I'm hoping my husband will be up for this type of update since his solution is gutting the thing sometime in the distant future! How resistant is the paint? Does it stand lots of water, for example? What about stains--from food and hot pans? I love your idea for my UGLY (did I say "ugly"?) dark blue tiled kitchen counter, which is the whole kitchen. It would be a great solution until we have the money to change everything--which will certainly take years... Thanks for sharing the project! So happy to find your post! I've been wanting to paint our kitchen tile for a while. It is hunter green. Ick. My question is... it has been over a year since your project. Has it still held up? My tile is throughout my entire kitchen and so would be a huge undertaking. Please let me know. 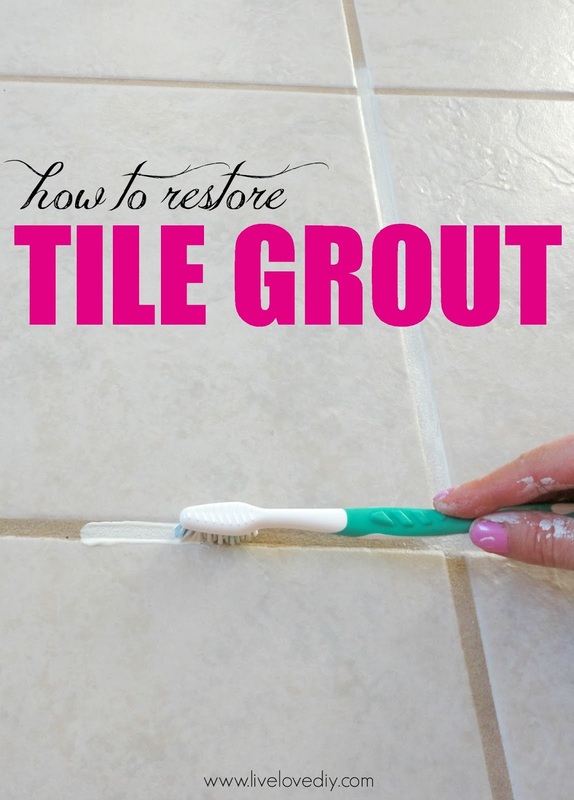 Did you do the grout restoration before you applied the paint? Or is the white grout on the finished product the result of the paint? Thank you! I did it! I "pinned" your post over a year ago, and this week I finally painted the peach 80's tile in two bathrooms. It looks so much better! Sadly, my inspiration to finally get going was a huge leak that led to two cabinets being put onto our front porch while the walls and floors are fixed, but it was nice to do the work outdoors. Now to experiment with homemade chalk paint to freshen up the cabinets, and then with the newly painted walls and new flooring, it will be a mini-remodel!